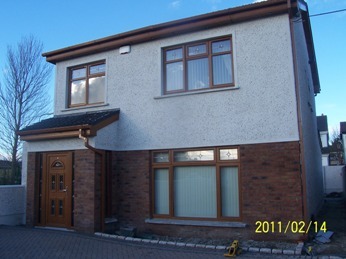 Project: Detached dwelling in Dublin 22 Date: 2006 - 2010 Job Description: Design & Project Management. Our clients were looking for an architect to design a new 4 bedrooms house in their side garden. They were interested with an air to water heat pump for compliance with the Building Regulations for energy efficiency. The planning permission was granted in 2006, but construction did not start before 2009. The clients asked for a conventional design to blend with the neighbourhood. They were interested with wider windows, an entry	porch and a ground floor extended to the rear. They required the attic to be structurally ready for conversion. Answering to our clients' brief, we proposed a rectangular layout with an open plan dining / kitchen. This idea was first rejected, but during construction	the clients decided to follow our advise, as they realised that one larger room would better suit their family. The design includes one double bedroom with ensuite and three single bedrooms. The heat pump is accessible from a cup board in the kitchen area. The dwelling facades matches existing dwellings in the neighbourhood, but the dwelling	envelope cannot be compared; it contributes to high energy efficiency within the dwelling. This is a house that looks ordinary, but it was built with highly performant technologies and materials. 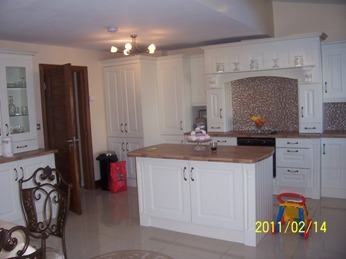 The clients used the services of a building contractor. Unfortunately, the limited company became bankrupt during construction when most of the first fix was completed. Thanks to stage payments and to the building contract that we provided, the client sustained little or no loss in relation to the contractor	bankruptcy. 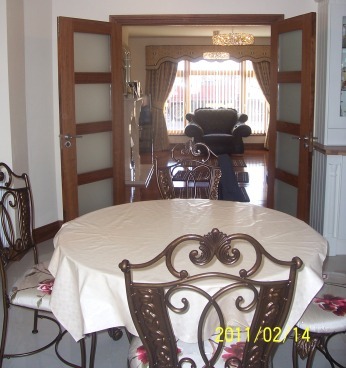 The clients took over the project by appointing trades to finish the works. We advised them on a self-build insurance. Some of the sub-contractors (electricity & plumbing) finished their works and were directly paid by the clients. The project was completed in 17 months.